This March the Hares Boys will have spent five long years in Israeli colonial dungeons for a crime that never happened. March 2013, a road accident. Five football-playing kids kidnapped, beaten, dragged to prison and accused of attempted murder. Because they were of the “wrong” ethnic/religious group. February 2016, the five kids -teens by now- convicted by a military tribunal that never gives a chance of a fair trial, because it represents the illegal, colonial occupying army. Fifteen years in prison because Israel the occupier says so. You will be out when you’re 31, having been torn away from your family when you were only 16. March 2018, five years on. The kids, known as the Hares Boys, have grown into beautiful young men. Their innocence remains, but so does the Zionist project of colonising Palestine. The Hares Boys are among hundreds of Palestinian children imprisoned by the Zionist Israeli military machine every year. Some as young as 12, others suffering from chronic illnesses, and all of them -including 16-year-old Ahed Tamimi- just because they are Palestinian. We are calling on you, freedom-loving people of the world, to mark the 5th anniversary by spreading the case and organising public events in your city and community. Let’s imagine a world in which children are not locked up in prison, in which terror and injustice are faded memories of the past – and then let’s work together to make it reality. For no-one is truly free until all are. في مارس القادم يكون أولاد حارس قد مضى عليهم خمس سنوات في سجون الاستيطان الإسرائيلي بسبب جريمة لم يقترفوها. في مارس 2013: حادث سير : خمسة أولاد كانوا يلعبون الكرة ، اختطفوا، وعذبوا، وسجنوا بعد توجيه التهمة لهم بمحاولة قتل، الذنب الوحيد هو انتمائهم لعرق بشري “مغلوط”. فبراير 2016 : الشباب الخمسة –في سن المراهقة الآن- ادينوا من قبل محكمة عسكرية لا توفر اية امكانية لمحاكمة عادلة، لأنها تمثل جيش احتلال استيطاني غير شرعي، بالسجن لمدة خمس عشرة سنة، لأن إسرائيل- الدولة المحتلة بالقوة- ادعت ذلك، وقالت لهم ستخرجون من السجن عندما يصل عمركم 31 سنة. بعد أن انتزعوا من كنف عائلاتهم عندما كان عمرهم 16 سنة. مارس 2018: مضت الآن خمس سنوات. الأطفال الذين يعرفون باسم أولاد حارس ، اصبحوا شباب يافعين. لكن براءتهم مازالت قائمة، كما الاحتلال الاستيطاني الصهيوني ما زال جاثما على كامل الأراضي الفلسطينية. أولاد حارس هم جزء من 700 ولد، وبنت من الشبان الفلسطينيين الذين يسجنون من قبل آلة الحرب الصهيونية الاسرائيلية سنويا. البعض منهم لا يتجاوز سن 12 سنة، بعضهم يعاني من الأمراض المزمنة، كل هؤلاء الأطفال اليافعين بمن فيهم عهد التميمي(16 سنة) ،يقبعون في السجون لمجرد كونهم فلسطينيين . نناشد الجميع، وكل عشاق الحرية في العالم بأسره عدم نسيان الذكرى الخامسة وتنظيم النشاطات والفعاليات العامة في كل مدينةـ، وتجمع سكاني، ومنتدى جماعي، لإحياء هذه المناسبة. لنحلم بعالم لا يسجن فيه الاطفال، عالم تختفي فيه المعاناة، والظلم وتصبح ميزة من ميزات الماضي الغابر. لنعمل جميعا لتحويل هذه الحلم الى واقع. لا يمكن لأحد أن يدعي الحرية حتى يصبح الجميع أحرارا فعلا. هيا إلى النضال معا ضد الصهيونية ، ومن أجل فلسطين الحرة. 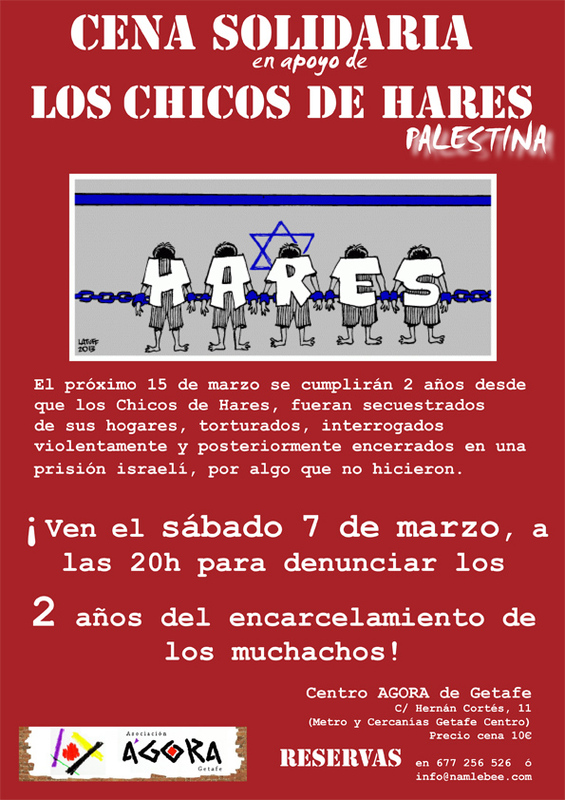 Este marzo los Chicos de Hares cumplen cinco largos años en las cárceles coloniales israelíes por un crimen que nunca ocurrió. Marzo de 2013: un accidente de tráfico. Cinco niños que jugaban al fútbol, secuestrados, golpeados, arrastrados a prisión y acusados ​​de intento de asesinato. Porque son del grupo étnico/religioso “equivocado”. Febrero de 2016: los cinco chicos –adolescentes a esa altura− son condenados por un tribunal militar que jamás ofrece la posibilidad de un juicio justo, porque representa al ejército de ocupación colonial e ilegal. Quince años de prisión, porque Israel –la fuerza ocupante− lo dice. Estarás afuera cuando tengas 31 años, después de haber sido arrancado de tu familia cuando sólo tenías 16. Marzo de 2018: cinco años después. Los niños, conocidos como los Chicos de Hares, se han convertido en cinco hermosos jóvenes. Su inocencia permanece, pero también persiste el proyecto sionista de colonizar Palestina. Los Chicos de Hares están entre 700 niñas, niños y adolescentes palestinos encarcelados por la maquinaria militar sionista israelí cada año. Algunos tienen tan sólo 12 años, otros padecen enfermedades crónicas; y todas esas jóvenes vidas, incluida Ahed Tamimi (de 16 años), están en prisión simplemente por ser palestinas. Les exhortamos a ustedes, personas amantes de la libertad en todo el mundo, a recordar este 5° aniversario difundiendo este crimen y organizando eventos públicos en sus ciudades, comunidades y espacios de participación. Imaginemos un mundo en el que los niños y niñas no estén encerradas en la cárcel, en donde el terror y la injusticia sean vagos recuerdos del pasado; y luego trabajemos codo a codo para hacerlo realidad. Porque nadie es verdaderamente libre hasta que todas lo seamos. LEE Y COMPARTE EL LIBRO DIGITAL: “LOS CHICOS DE HARES. DE PALESTINA A LA PRISIÓN ISRAELÍ”. 31 January 2016 — Download the Press Release in .pdf format here. Thursday 28 January, 2016 was the day when the five youth known internationally as the Hares Boys were officially sentenced to 15 years’ imprisonment in an Israeli occupation prison, by an Israeli occupation military court, in a land occupied by Israel. The sentence was announced following almost three years of uncertainty since Mohammed Suleiman, Mohammed Kleib, Ali Shamlawi, Tamer Souf and Ammar Souf – residents of Hares village in the West Bank of Palestine – were arrested and accused of ‘attempted murder’ by stone-throwing after an illegal Israeli settler car crashed into a truck parked on a road next to their village. That was mid-March 2013, light years away when you are 16 years old and locked up in an occupation dungeon for a car accident you had nothing to do with; a crime that never happened. Thursday’s sentencing was a plea deal offered by the Israeli military prosecutor that involved ‘fines’ of NIS 30,000 (appr. €7,100 or $7,750) per boy to be paid to the settler driver as ‘compensation’. One of her daughters died two years after the crash from pneumonia complications attributed to neurological damage experienced during the accident. Failure to accept the deal, it was implied, would result in extended prison sentences. The boys’ families felt they had no choice but to accept. “We took the bad to avoid the worst,” they said in their despair. Almost three years of legal battles in military courts that have a record of convicting Palestinians at a rate very close to 100%. Almost three years of military court ‘hearings’ that last just a few minutes, conducted by Israeli military personnel in Hebrew, a language neither the boys nor their families understand; the soldier-translator would rarely do their job properly and would instead prefer to play with their phone. Almost three years of dozens – well over 100 – such ‘hearings’ in metal cages that pass for a House of Justice, only to find out that your incarceration is prolonged once again. Almost three years knowing that you ‘confessed’, under torture, of throwing stones at settler cars, that you ‘confessed’ after being beaten up and psychologically intimidated, and spending days in solitary confinement without access to a lawyer, and that this ‘confession’ is the only ‘evidence’ the military tribunal has against you, yet that it would probably be enough for them to convict you. Almost three years of mothers, fathers, sisters, and brothers not knowing whether you would be home for the next Ramadan or to finish your high school exams. Not knowing when they could finally hug you and talk to you without a broken telephone through a dirty glass window. Almost three years of international efforts to bring the case of the Hares Boys to the eyes and consciences of those in power, and to demand justice. We invited you to protest, organize demonstrations, write to your MPs, write to your embassy in Tel Aviv, attend military court ‘hearings’, collect money to help the families deal with the financial burden, to spread the message about the injustice being committed to these young lives of Palestine. And you responded, in your hundreds and in your thousands, from Costa Rica to France, from Mexico to Britain. We thank you for that. You’ve been a lifeline of support to the boys’ families in such devastating time. If we stop demanding justice, five young men are to spend the next 15 years of their lives in prison. For them and other prisoners, their families, communities and their people, we must continue the struggle. We invite you all, wherever you are, to join hands with us, to strengthen the efforts to achieve justice and FREEDOM for the five youth of Hares, Palestine. 17 May 2015 — Ali’s court ‘hearing’ was postponed again, until 28 May. Ammar and Mohammed Suleiman have theirs scheduled for 20 May. Others to be confirmed. This has been dragging on for 2 years and 2 months now. In the words of a prominent British human rights lawyer, the Hares Boys’ case would have been won in less than 5 minutes if it were heard in a real court of justice, not the Israeli military-run places of horror that pretend to be courts. 20 March 2015 — Two years on, the nightmare is still very much ongoing. If you are in Palestine please consider attending. If you are not in Palestine please contact your embassy and ask that they attend on your behalf. You can also inquire if your state – via its foreign representative the embassy – cares about human rights and children’s rights in particular. Oh, and the Geneva Conventions and other international law. If positive, what are they doing about it when Israel violates them all, as in the case of the five kids from Hares village? 20 March 2015 — Numerous events took place around the globe in the last few weeks in solidarity with the Hares Boys. We thank all the good people who made them happen in Costa Rica, Mexico, Uruguay, Bolivia, Britain, the US, and Palestine. But the struggle is not over. The boys have now spent 2 years and 5 days in prison for no crime at all. We must continue putting pressure on Israel to honour justice and free these kids, as well as all Palestinian children from Israeli occupation jails. 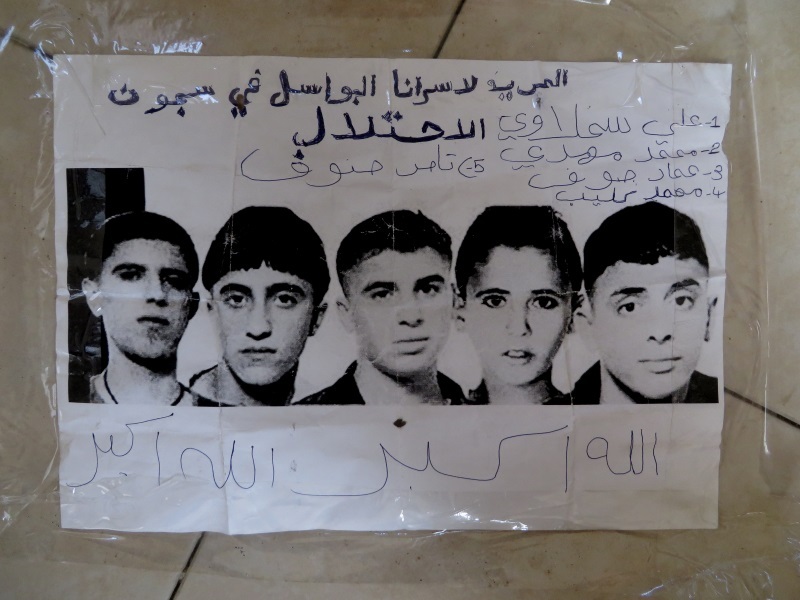 4 March 2015 — 15 March 2015 will mark 2 years since the five kids from Hares, occupied Palestine, were kidnapped by the Israeli army and incarcerated for a crime they did not commit. With their future still uncertain, good folk around the globe are calling for justice and freedom for the Hares Boys! 3 March 2015 — GLASGOW, Scotland Sunday 15th March 14.00-16.00 FREE THE HARES BOYS! FREE PALESTINE! 15 MARCH DAY OF ACTION GLASGOW. 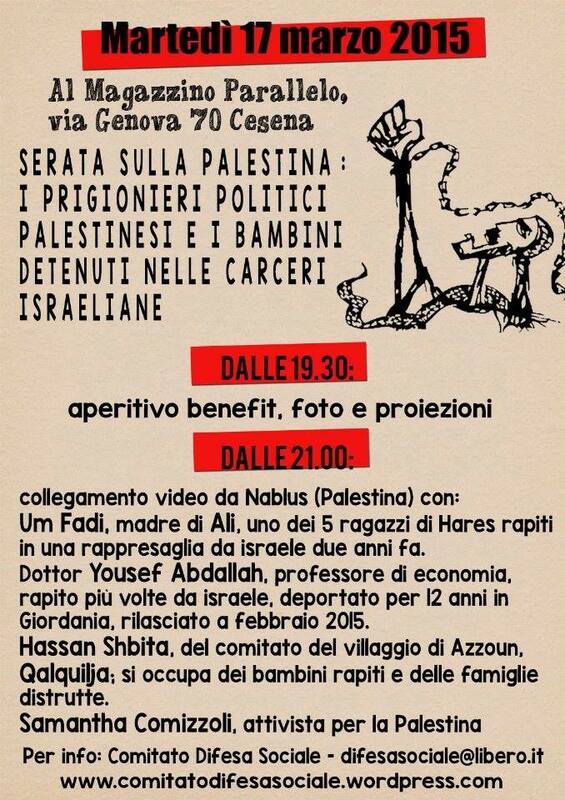 Come and fight for justice for Palestinian children in Israeli occupation dungeons! 3 March 2015 — London Britain, Friday 13th March 8.00-9.30, near the Houses of Parliament: protest by London Palestine Action to mark the 2nd anniversary of the Hares Boys’ incarceration. JOIN IN! Thank you Ms. Vallina for your high moral stance. We’re waiting to hear what the High Representative replies. Ali Shamlawi’s mother (L) and Mohammed Suleiman’s mother (R). Ali’s mother addressing the media. Malak al-Khatib, 14-year-old Palestinian from a village in Ramallah who was kidnapped in December by the Israeli occupation army and sentenced to 2 months in prison for alleged stone-throwing and possessing a knife. The army kidnapped her on her way home from school. Malak is holding a poster of the Hares Boys and of Khaled, another 14-year-old sentenced to 4 months in prison for alleged stone-throwing. Khaled has anemia and his health in the prison is deteriorating. If you possess a foreign passport and are currently in Palestine, please consider attending to witness justice not being done. Get in touch for details on how to reach Salem. 18 February 2015 — The car accident that took place in March 2013 on Road 5 in occupied Palestine has claimed 6 victims. Israeli media reports that Adele Biton, the daughter of the settler car driver, died yesterday in hospital after complications caused by pneumonia. The five Hares Boys remain in prison for a crime they did not commit. 12 February 2015 — Good people in Costa Rica have responded to our call for action for the Hares Boys on 15th March, to mark the 2-year anniversary of their kidnap and incarceration. Please see the facebook invite to the event here: LIBEREN A LOS CHICOS DE HARES and tell your friends about it! 11 February 2015 — Tomorrow i.e. Thursday 12th February Ali Shamlawi will appear at Salem again. Five days later, on Tuesday 17th February, it will be the turn of Mohammed Suleiman, Mohammed Kleib, and Ammar Souf. Again. We invite international observers to attend these court ‘hearings’ and see for yourself what a mockery of justice they are. If you possess a foreign passport and are currently in Palestine, please consider attending to witness justice not being made. If you are abroad please continue to ask your diplomatic representatives in Tel Aviv or Jerusalem to attend. We have draft letters in English, Spanish, French, and Finnish. An international observer was present during Ali’s ‘hearing’ – thanks to everyone who kindly demanded that they attend! We are to see what comes out of that, and we still need to keep up the pressure for all the five boys. Please contact your diplomatic representative in Jerusalem or Tel Aviv and ask them to attend. 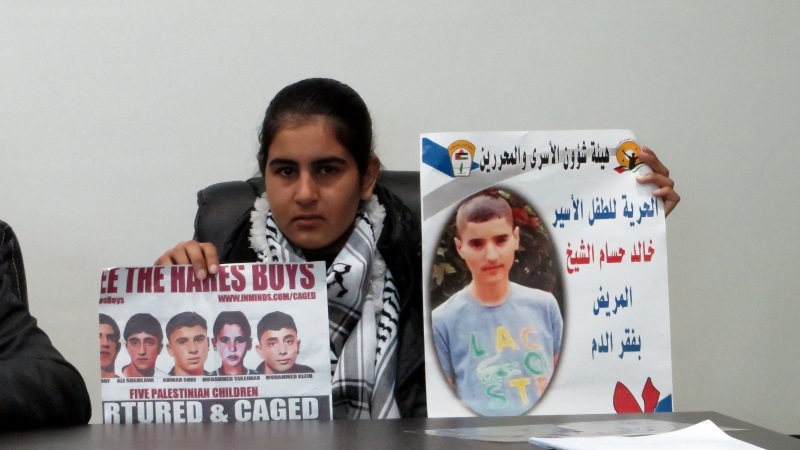 6 November 2014 — Today’s Ali’s “hearing” only prolonged the boy’s incarceration in Israeli occupation prison Megiddo. Ali is next to appear at Salem military court on 27th November. Please kindly demand that your ambassador or consul or lawyer friend attend. Please contact your diplomatic representative in Jerusalem or Tel Aviv and ask them to attend. IT DOES MAKE A DIFFERENCE. 15 September 2014 — Please help Ali’s family to cope with the lawyer bill! Around £1,200 is still needed to meet the legal costs of one of the Hares Boys, Ali Shamlawi. Please consider donating. It’s easy and safe, here: DEFEND CHILD PRISONERS – SUPPORT THE HARES BOYS! Please send a letter to your diplomatic representative in Jerusalem or Tel Aviv asking them to witness these ‘hearings’ by themselves. The presence of outsiders at the court room does make a difference to the way the boys are treated. It also reminds Israel that the world is watching. Thank you. 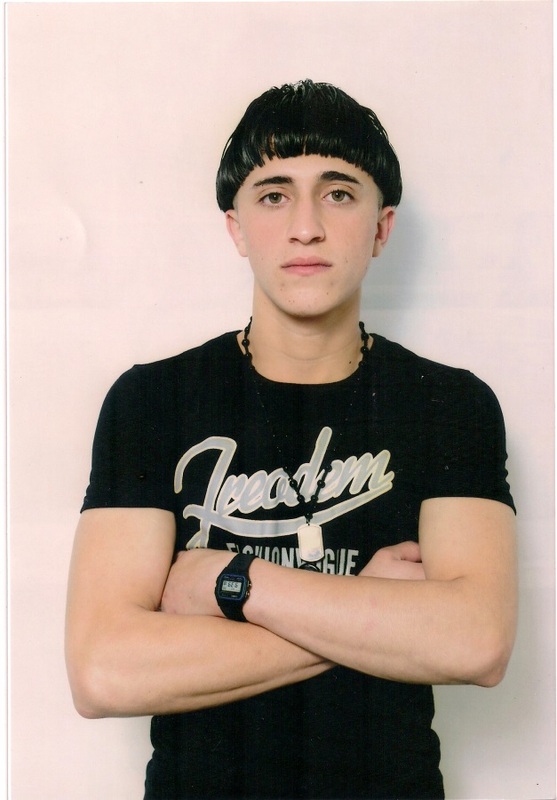 10 August 2014 — Samer Touf, the brother of Tamer Souf, was kidnapped from Hares by the Israeli army. However he was released several days after. Tamer has been in prison for almost 18 months now, for something he did not do. 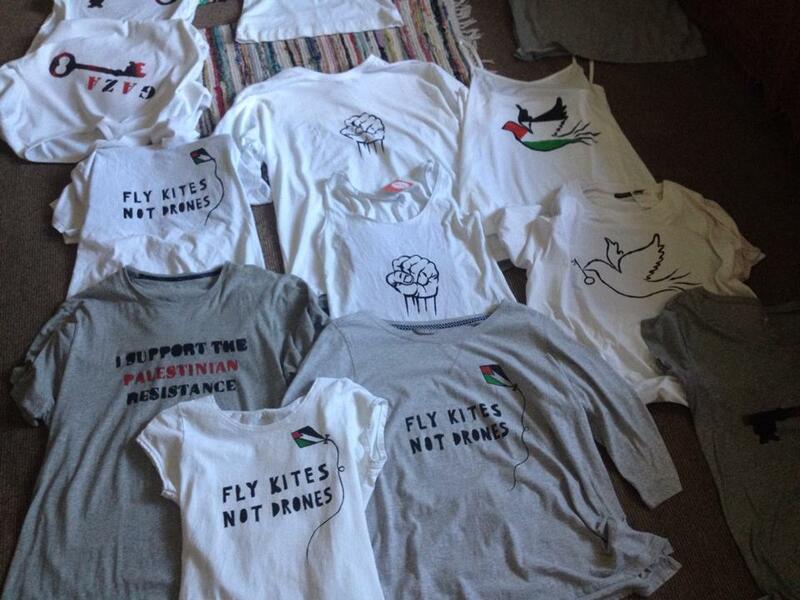 8 August 2014 — The amazing people at London Palestine Action raised £1,000 for the Hares Boys families! 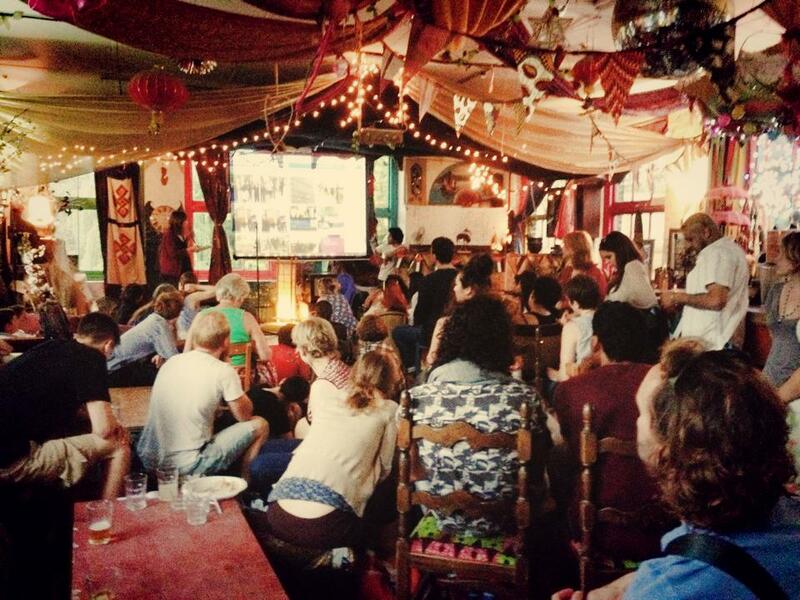 The event – at London’s Passing Clouds in Hackney – was a huge success. Very soon the money will reach the boys’ families and we hope that it will help them deal with the financial burden of having their children imprisoned. Thanks so much to everyone who made this happen! 17 June 2014 — Not much happened in last week’s ‘court’ ‘hearings’. The boys are to appear for their next ‘hearings’ in a few weeks – as they have for the last 15 months. This is the dim reality of being thrown into a military ‘court’ system: it is not about justice; it is about breaking the spirit. If you are in possession of a foreign passport and currently in Palestine, please consider attending. Salem military court is north of Jenin and ‘hearings’ start at 9am, but since the ‘security’ checks take a long time and people get stopped and made wait for no apparent reason, one should be present at Salem at 8-8:15am. Also please remember that the military court does not provide lawyers nor family members or other visitors with a schedule of appearances – so get ready to wait all day long, as all families do, to be allowed in. ..every time that boy comes back home after his time in Israeli prison, and he comes back different. His life has been stolen from him. They’ve been incarcerated for 14 months now, with no evidence against them. How will they get back this time of their young lives back? Ali Shamlawi appears at Salem military court on 5 June. Please try and attend if you can – or ask your diplomatic representatives to do it for you. The Israeli military court has not provided the exact court dates for all of the boys. Neither the lawyers nor the boys’ families know. Please consider attending the court ‘hearings’ if you are in Palestine, or send a letter to your diplomatic representative in Jerusalem or Tel Aviv asking them to attend. The presence of international observers does make a difference to the way the boys are treated in the military court. Thank you. 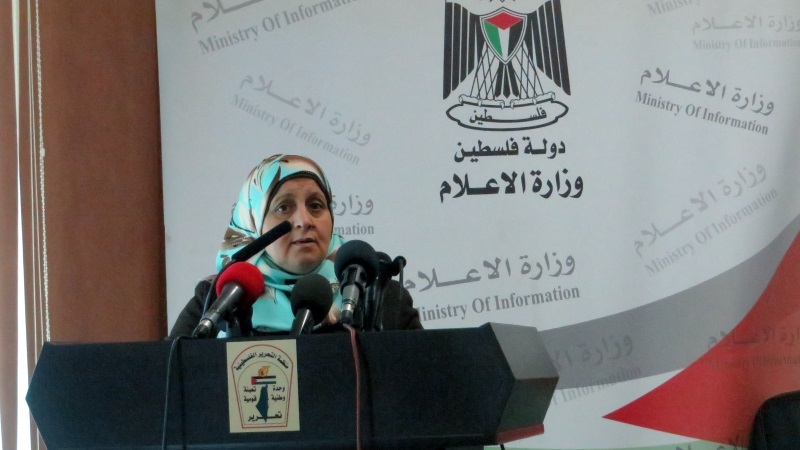 19 April 2014 — For Palestinian Prisoners’ Day (17 April), reports have been released documenting the inhumane and illegal treatment of women, children, and men in Israeli jails. Below are some links, if you have others to add please do so in the comment section. Thank you. 2. On 16 April, the day before the Prisoners’ Day in Palestine, we are planning to coordinate a Twitter action. We ask that you join us on Wednesday 16 April at 20:00 (UTC/GMT +2 Palestinian time) for one hour! The Twitter hashtag will be tweeted from the ISM Twitter account as the action starts so please stay tuned! Damien Austin, tortured as a child during the Irish struggle for freedom, sends his solidarity to the Hares Boys and all Palestinian children kidnapped and incarcerated by the occupation regime. Damien asks them to “never give up hope” and sends a message to the world to show solidarity. اليوم، وبعد تعرضه للتعذيب في طفولته أثناء الصراع الايرلندي لنيل الحرية، يبعث داميان أوستين رسالة تضامن لأطفال قرية حارس وكل الأطفال الفلسطينيين وللعالم أجمع ويقول: “لا تفقدوا الأمل أبداً”. في يومي 15 و 17 مارس، تعرّض 5 أطفال من قرية حارس في سلفيت للاعتقال والتعذيب على يد أجهزة الأمن الاسرائيلية للاعتراف بجريمة لم تحدث أبداً! في 15-17 مارس 2014 يمضى على اعتقال الأطفال الخمسة أكثر من سنة في سجن إسرائيلي للبالغين بالرغم من عدم وجود أدلة ضدهم أو بالجريمة المرتكبة. ليس هناك سبب للاحتفال وملايين القلوب تنزف لأجل خمسة أرواح يانعة سلبت حريتها على يد احتلال غاشم لا يحترم الحياة البشرية; حياة المئات من المتضررين في السجن من ابن، أخ، ابن عم أو ابن خال، صديق، و زميل في فريق كرة القدم. إذا تمت إدانة هؤلاء الأطفال، فهذه القضية سوف تكون سابقة خطيرة للغاية في نظام المحاكم العسكرية الاسرائيلية، حيث سيتعرض أي طفل فلسطيني يتهم برشق الحجارة لعقوبة بالسجن لعدة سنوات (متوسط الحكم حالياً هو 3-6 أشهر). تعود هذه القضية بنا أدراج الذاكرة إلى الإساءة التي تعرض لها الأطفال والشباب الايرلندي على يد شرطة المستوطنين. 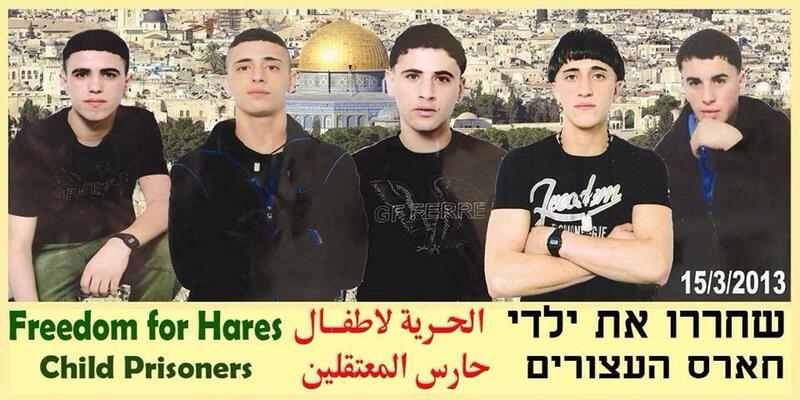 15-17 March 2014 — One year ago today five teenagers from the village of Hares in Palestine lost their freedom. It is not only their tragedy – children in prison are a tragedy of our humanity. Let’s all work together to make sure they can hug their mothers again soon. This week marks the one year anniversary of the kidnapping and imprisonment of the Hares Boys. It is not a cause to celebrate. Five young lives put on hold by an occupation regime that has no respect for human life; hundreds of lives affected by the incarceration of a son, a brother, a cousin, a friend, a football team mate. Millions of hearts bleeding. We kindly ask you to publish the following press release on your website/zine/blog, share it widely with your social circles, forward it to your MP, embassy or consulate in Jerusalem. We have copies in English , Spanish, German, and Portuguese – thanks to the wonderful volunteers who made it happen! 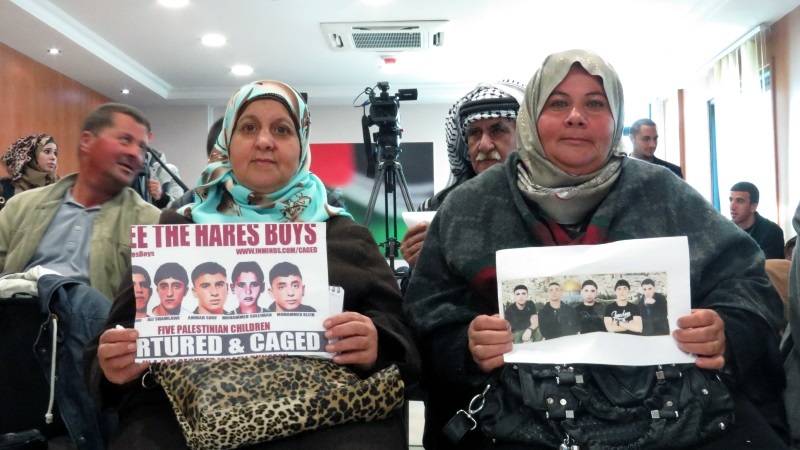 On 15-17 March 2014 the Hares Boys will have spent exactly one year in an Israeli adult prison despite a total lack of evidence against them or indeed of a crime having been committed. If convicted, this case could set an extremely dangerous precedent in the Israeli military court system, whereby any Palestinian child accused of throwing stones could be sentenced to long years in prison (currently the average sentence is 3-6 months). 26 February 2014 — Ali Shamlawi next appears at Salem military court on 13 March 2014. That’s just 4 days short of one year that he will have spent in prison on trumped-up charges. If you are in Palestine, please consider attending his hearing – seeing internationals there the court might behave better towards the children and their families. Thank you. From the above we know that British embassy staff had a meeting with the Israeli army and the Israeli Ministry of Justice a couple of weeks ago, and that British diplomatic representatives asked about the Hares Boys. What we do not know is the answer they received from the Israelis, if any. If you are in Britain, please write to your MP asking them to follow-up on this. Questions are raised to be answered. Thank you. “Greetings to all free people around the world. I am the father of the child prisoner Mohammed Mehdi Suleiman, I ask that you all support our Palestinian captives against the injustice of the Zionist occupation against our prisoners in the courts. And I ask lawyers from all over the world to support my son and the other kids. I would like to inform you that my son’s next court hearing is on 9th March 2014. I have not seen my son or heard his voice.. I am suffering a great pain.. Where is the UN? Who can stop such injustice? My son and the other kids have been tortured and are still under torture – both psychological and physical. 23 January 2014 — Ammar Souf is scheduled to appear at the Salem military court on 17 February 2014. It will then be 11 months since he and the other boys from Hares village were arrested. Eleven months of a child’s life stolen. Such is the Israeli occupation of Palestine. 21 January 2014 — A huge thanks to all those who contributed to the crowdfunding project!! We have raised 3,062 euro to date which the five families will share equally. The money will help them bear the financial burden associated with having their young sons imprisoned. Thanks for all your support so far and let’s continue fighting for the boys’ freedom. Really I don’t know what to say, words fail to express my feelings, I do not look at your support in terms of material, but I look at your humanity, feelings, and your love of justice that led you to help us in our problem. I’ll never forget your support and your efforts. Thank you for the help we really need it. I thank all those who contributed to the campaign and offered the money. Thank you very much to all of you, we will never forget your help! Thank you so much, we were pleased with your help for our children, we will always remember your help! 16 January 2014 — The judge prolonged Ali’s incarceration before trial once again. Ali was due to appear in court today but the “hearing” has been postponed until 13 February. It will then be 11 months since the night the five teenagers were deprived of their freedom. 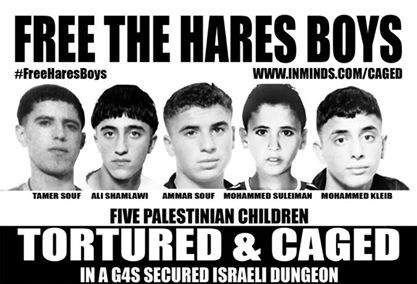 We need to keep up international pressure – please email your MP and your embassy and let them know you demand justice for the Hares Boys, justice for all Palestinian children in Israeli jails! Thank you Ali, Muhammad S., Muhammad K., Tamer, and Ammar. Our warmest greetings to you. May you soon have your freedom. In a few days, the Hares Boys will have been in prison for 10 months. It is important for them to know that they are not forgotten, that there are people out there fighting for their freedom. The boys’ families are due to visit them within the next couple of weeks. If you can take a little bit of your time to send a message of support, please send them in and we will forward them. Thank you. Defense for Children International-Palestine (DCI-Palestine) and Lawyers for Palestinian Human Rights have launched a campaign “Know Your Rights”, aimed at empowering and educating children and youth about their legal rights when detained in the Israeli military detention system. Around 500-700 Palestinian children, some as young as 12, are arrested, detained and prosecuted in the Israeli military detention system each year. 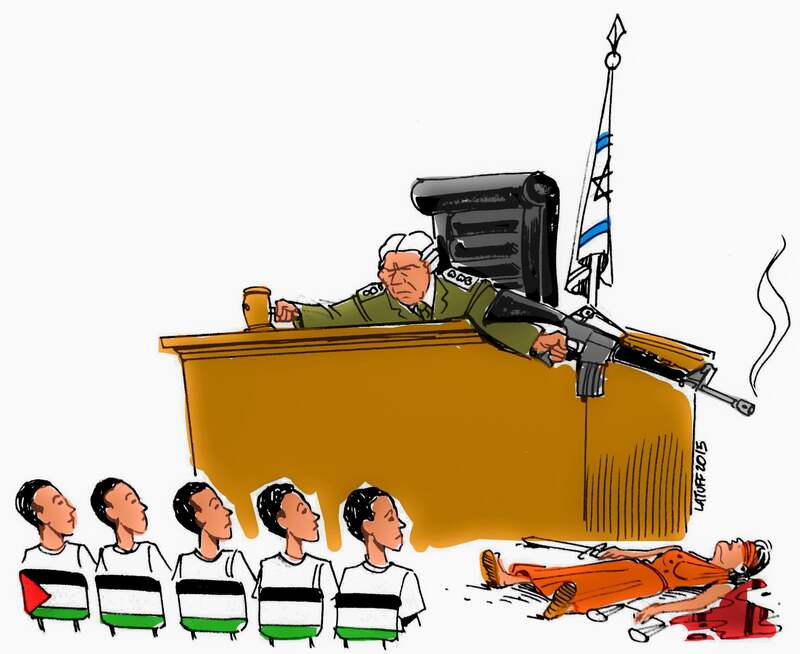 Israeli military courts, to which Palestinian children are subjected, lack basic and fundamental fair trial guarantees. More information here: Know Your Rights Joint Public Statement. 9 December 2013 — The brilliant political cartoonist Carlos Latuff has created this image for the Hares Boys campaign. Many thanks to Carlos! Please feel free to use it on posters / flyers / other campaign material, and share it on social media. You can find more of Carlos’ work here. Dates for Tamer Souf have not yet been confirmed. “Today [6 Nov] was the day to visit my son Ali in prison, as it was for Ammar’s and Mohammed Suleiman’s families. Tamer Souf had a court hearing. The visit did not happen. After suffering a crossing through Qalqiliya to ’48 [Palestine before UN partition; currently Israel] where the Megiddo prison is, and after riding the bus and waiting to get to the prison we were told that the visit had been cancelled because of the death of Palestinian prisoner Hassan al-Turabi in the prison. Tamer’s court hearing was postponed to 12 November. I suffered a lot because of the cancellation of the visit, but the most painful is my fear for my son and his fate in the prison. I do not know if [Ali’s] court hearing will happen tomorrow or not. The Israeli occupation prevented us yesterday from visiting our children in Megiddo prison and delivering the winter clothing and blankets for them because of the tense situation that prevailed in Israeli prisons after the death of Palestinian prisoner Hassan al-Turabi. 7 November 2013 — A crowd-funding project to help the Hares Boys families lessen the financial burden of having their children incarcerated by the racist regime is now launched! Please donate generously and spread the word! 7 November 2013 — Ali Shamlawi’s next court hearing has been postponed to 19 December. By that time the Hares Boys will have spent 10 months of their young lives in prison for the sole reason of being Palestinian. Take action for Justice for the Hares Boys today. Please send a letter to your embassy in Tel Aviv asking them to attend the hearings. 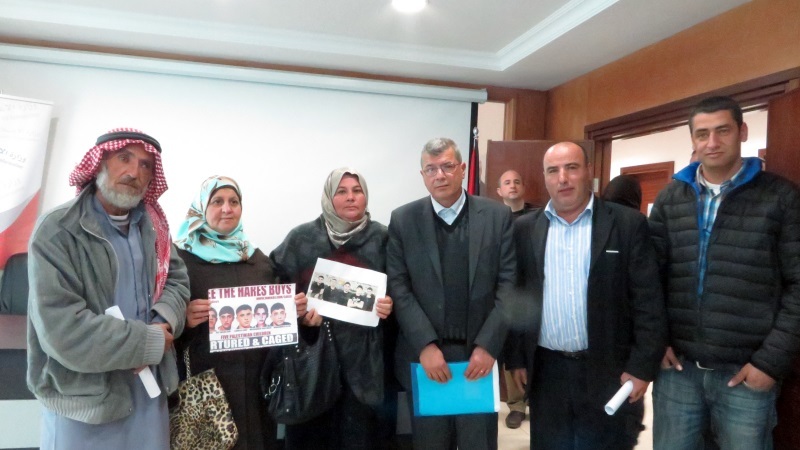 They have been closed to the public ever since the boys were put in prison back in March 2013. International presence at the Israeli military court can and does make a difference to the way the boys and their families are treated. 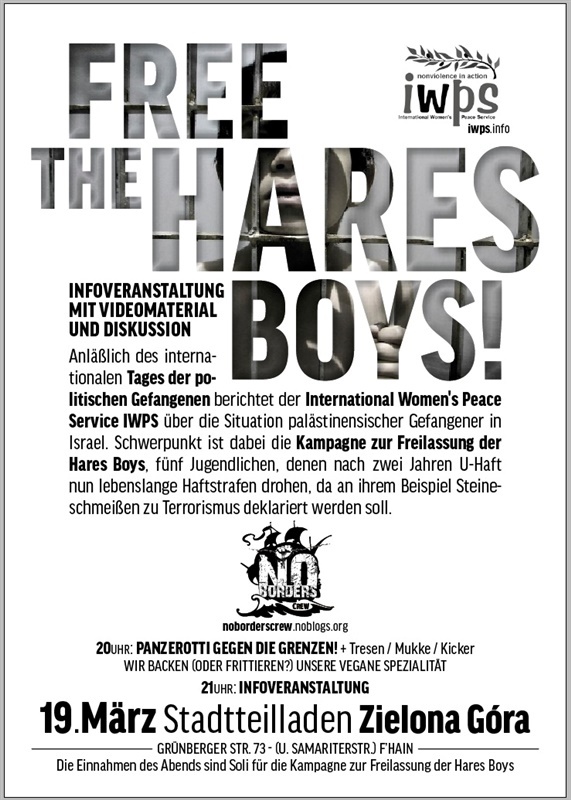 21 September 2013 — Global solidarity events with the Hares Boys! We hope to see you there! Please spread the word. Court dates for Ammar Souf and Mohammed Kleib TBC. What you can do: Write a letter/email to your embassy in Tel Aviv asking them to attend the hearings. It’s easy and it can make a difference to the way the boys are treated in court. Why it’s important that internationals take action: Given their discriminatory attitudes and practices, the Israeli military courts might actually change their behaviour when international observers, be it diplomatic representatives, journalists, or civilians with foreign passports, are present. Putting pressure on the military courts to obey the principles of justice and showing them that the world is watching is extremely important. 29 August 2013 — Ali Shamlawi‘s next court hearing has been postponed until 3 October 2013. Ali sends his regards to all supporters and who are in solidarity with him in the world. He knows that there is injustice in this life, but he also knows that there is justice, and there are good people who love peace and justice. When I saw Ali, he was sad because the new school year has begun, and he cried when he asked me ‘Has the new academic year begun at school?’ He was in the 11th grade. He longs to see his friends and his books and his seat at school. He misses the football team the Dabkeh team, of which he is a member. He feels bored. He appeals to his supporters to stay with him until he comes out of this nightmare and return to his studies, his family and his friends. He asks you to continue to provide support and assistance. When you send a letter to your embassy in Tel Aviv asking them to attend a court hearing for one (or all) of the boys, please insert their name and the court date. Many thanks for those who already took action! 31 July 2013 — The petition demanding Freedom for the Hares Boys is now ready! Please sign and ask all your friends, family, and acquaintances to sign! 28 July 2013 — Ali Shamlawi’s court hearing that was supposed to take place on 25 July has been postponed until further notice. Thanks to everyone who tried to attend it and to those who’ve been sending letters to their embassies. We need to step up pressure on the Israeli military court with the latter, for we have a few weeks until the next court hearings of Muhammad S., Muhammad K., Ammar S., and Tamer S. Updates on exact dates will follow as soon as we hear from the families. 17 July 2013 — ACTION! Demand Justice for the Hares Boys – Protest G4S complicity in their torture! The British-Danish security company G4S serves both the Al-Jalame and Megiddo prisons in which the boys have been tortured and are still being kept. Join the protest in London to tell G4S that that is not OK. Demand the immediate and unconditional release of all the children and to hold G4S accountable for its complicity in Israel’s crimes, particularly in the torture of children. 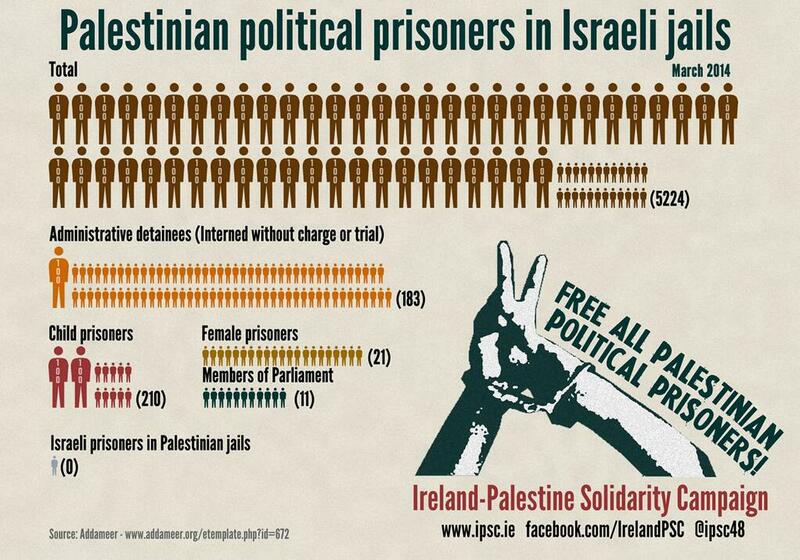 Organised by the Palestinian Prisoners Campaign. 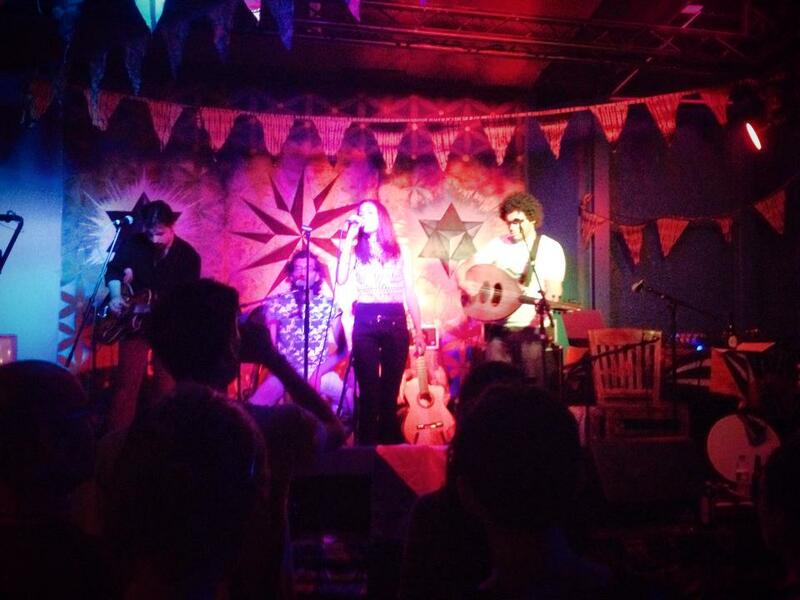 A night of live music to raise money for the Hares Boys’ legal fund. Come enjoy and contribute to make a difference! Mohammed Kleib, Mohammed Suleiman, Tamer Souf, and Ammar Souf have their next court hearings at the end of August. In the last months, all the court hearings for the Hares Boys have been closed to the public. Put pressure on your country’s embassy in Tel Aviv and ask them to attend the hearing. International presence has proven to make a noticeable difference in the behaviour of the military court. We’ve prepared letters/emails to embassies that you are welcome to use, but also please feel free to write your own one. Alternatively, give your embassy a call; or, if they insist they cannot attend the hearing physically, ask them to express concern about the Hares Boys to relevant Israeli institutions.